Plan four fun Sunday afternoons downtown: September 9th, 16th, 23rd, & 30th. Kentucky State University Boat, 90-minute free educational river cruise. 2:00pm, Riverview Park Boat Dock. Reservations are required, email Ed Wilcox at ed.wilcox@kysu.edu. Alley Cat Art, pop-up art event on Catfish Alley 1:00-5:00 pm. More info here. Sundays in September you can jump on the FREE trolley and ride through Frankfort’s beautiful downtown district. During your visit, you can enjoy several business and restaurants ready to serve you. 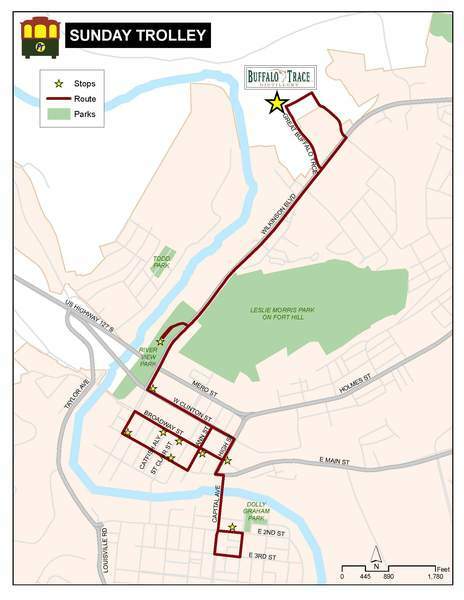 There will be a continuous 30-minute loop from Buffalo Trace Distillery to points around downtown Frankfort from 12:00-5:00pm. *The trolley will pick up at any stops along the Sunday Route. See below for a map of the route.